254 pages | 7 B/W Illus. This book contributes to an emerging field of study and provides new perspectives on the ways in which Gothic literature, visual media, and other cultural forms explicitly engage gender, sexuality, form, and genre. The collection is a forum in which the ideas of several well-respected critics converge, producing a breadth of knowledge and a diversity of subject areas and methodologies. It is concerned with several questions, including: How can we discuss Gothic as a genre that crosses over boundaries constructed by a culture to define and contain gender and sexuality? How do transgender bodies specifically mark or disrupt this boundary crossing? In what ways does the Gothic open up a plural narrative space for transgenre explorations, encounters, and experimentation? With this, the volume’s chapters explore expected categories such as transgenders, transbodies, and transembodiments, but also broader concepts that move through and beyond the limits of gender identity and sexuality, such as transhistories, transpolitics, transmodalities, and transgenres. 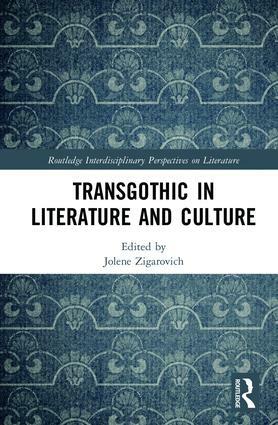 Illuminating such areas as the appropriation of the trans body in Gothic literature and film, the function of trans rhetorics in memoir, textual markers of transgenderism, and the Gothic’s transgeneric qualities, the chapters offer innovative, but not limited, ways to interpret the Gothic. In addition, the book intersects with but also troubles non-trans feminist and queer readings of the Gothic. Together, these diverse approaches engage the Gothic as a definitively trans subject, and offer new and exciting connections and insights into Gothic, Media, Film, Narrative, and Gender and Sexuality Studies. Chapter 1. "Beyond Queer Gothic: Charting the Gothic History of the Trans Subject in Beckford, Lewis, Byron"
Chapter 2. "Go to Hell: William Beckford’s Skewed Heaven and Hell"
Chapter 3. "Transgothic Desire in Charlotte Dacre’s Zofloya"
Chapter 4. "That Dreadful Thing That Looked Like A Beautiful Girl": Trans Anxiety/Trans Possibility in Three Late Victorian Werewolf Tales"
Chapter 5. "Monster Trans: Diffracting Affect, Reading Rage"
Chapter 6. "More Than Skin Deep: Aliens, Fembots, and Trans-Monstrosities in Techno-Gothic Space"
Chapter 7. "Gothic Gender in Skin Suits, or The (Transgender) Skin I Live In"
Chapter 8. "The Media of Madness: Gothic transmedia and the Cthulhu mythos"
Chapter 9. "Black Weddings and Black Mirrors: Gothic as Transgeneric Mode"
Chapter 10. "The state of play: transgressive caricature and transnational Enlightenment"
Jolene Zigarovich is Associate Professor in the Department of Languages & Literatures at the University of Northern Iowa, USA.